How likely am I to get the money back when I sell my house? It’s a fundamental question facing anyone who has ever embarked on a home renovation. There’s no easy answer, because what a buyer might be willing to pay depends on many factors — everything from the choice of project, to the materials used, to the value of other homes in the neighborhood. It’s important to know that not all remodeling projects are created equal. When selling a home the two most closely inspected and anticipated rooms of a house are the kitchen and bathrooms, especially the master bathroom. They’re the interior spaces where the most value can be added during a sale, so they must really shine. Follow these spending tips when tackling a bathroom makeover. – Keeping Up With The Joneses: Before planning any interior upgrades, consider the neighborhood – and more importantly, the target buyer. If most of the homes nearby have tidy, neat bathrooms with laminate or tile countertops, then your home should, too. If granite and flagstone seems to be the local flavor, hopefully your home will be similar, since that’s what local buyers are after. – Don’t Over Do It: Establishing the quality level of comparable homes is also crucial to saving thousands. The desire is to make the home look as fantastic as possible without wasting money, over-investing and ultimately creating a space that’s out of place with the rest of the houses in the neighborhood. – Make The Most Of It: Even if the bathroom is looking very tired, keep the main elements and simply improve what you can using a cost-effective, low-labor strategy. Resurface or repaint cabinet doors, replace cabinet hardware, install a new faucet, upgrade the lighting with new fixtures and put on a fresh coat of paint. – Study Up on the Latest Trends: Don’t waste thousands of dollars installing trends that went out-of-style years ago. Whirlpool bathtubs and stand-alone bidets are no longer luxury bathroom indicators. One of the most surprising bathroom trends in 2018 has been towards smaller bathrooms with a focus on efficiency and small-scale luxury. The secret to making small bathrooms feel grand is to put every inch to good use. There are many ways to utilize the space at hand, including shelves, floating vanities and space-saving walk-in showers. Radiant heat continues to be a dominant bathroom trend year-after-year. Radiant heating can be used with a variety of flooring options such as tile, concrete, vinyl and wood. In a bathroom, the once-cold tile can transform into a soothing warm floor. There’s also a push for bathrooms going high-tech, especially toilets. Technological toilet updates include seat warmers, automatic lid openers and slow close features, an adjustable air dryer and built-in deodorizers. Another feature available is a wireless music player that automatically turns on when the lid is opened and shuts off when the lid is put back down. There are also smart showers that turn on an individual’s favorite music and automatically knows their preferred water temperature. Among the hottest bathroom trends of 2018 was the comeback of brass and gold fixtures. The warm brass and gold tones add depth and a luxurious feel. Offered in a number of finishes such as satin, matte and spun gold, these fixtures provide the added bonus of hiding fingerprints and water spots. Creative lighting techniques are another popular trend this year. Homeowners are using dimmers, light bars, scones and pendants to create a luxury feeling in their bathrooms. For larger bathrooms, it’s not uncommon to see a statement chandelier. The various lighting options not only help with makeup application, they foster better bathroom aesthetics. Neutral styles remain a top trend. Homeowners today love a palette of whites and grey that make a space look modern and elegant. With a dash of nuance, 2018 has brought an infusion of organic colors blending with these neutral color palettes. The new neutral features whites and grays with organic accents of nature — greens, blues and warm browns. This includes a push to bring the outdoors indoors through the use of plants and flowers. 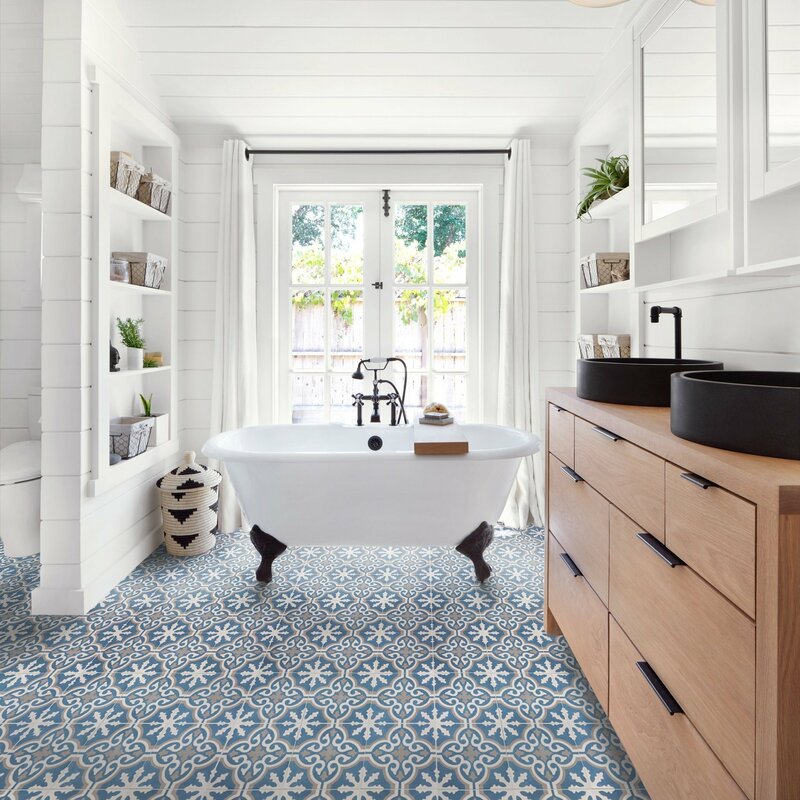 Tile became a focal point in 2018. Homeowners are no longer content with just a subway tile or a large format tile on the wall. Today there are lots of tile shapes to choose from including hexagon, arabesque, diamond, Moroccan fish scales or chevron patterns in new colors & textures. These outspoken tiles will not just be found on the floor. They will also be used as backsplashes, on shower walls and possibly ceilings to create accents. Upon reading about the hottest bathroom trends in 2018, it can be easy to get carried away. Whether you are planning to do a bathroom renovation or just add a few upgrades, keep in mind that just because a project is expensive, it doesn’t mean it will pay back more. Often, minor improvements can yield major dividends. According to Remodeling magazine’s annual analysis of cost versus value, a face-lift — painting, refinishing surfaces and upgrading fixtures — will return more than a full redesign. The key to spending less is spending it wisely. Design and product selection are key. Whether selling your home is on the near or distant horizon, it’s vital to consider how likely you are to get the money back when considering the cost of a renovation project. Talk with the experts, always research the latest trends and keep in mind the value of other homes in your neighborhood.